Turkey tacos: Skip the taco packet for your next Taco Tuesday and make these healthy turkey tacos. A healthy and filling dinner will be on the table in under 25 minutes! Tacos were pretty much an every-week staple at my elementary school growing up. And I remember this being a crazy popular lunch day but I don’t remember ever eating them at school. In hindsight, my brother and I were lucky kids; our mom was a work-at-home mom (almost unheard of in the 80s) and she had the ability to be there every morning to make our lunches. Once a week, she gave us money to buy lunch at school and I picked carefully: either deli day (Thursdays) or pizza day (Fridays, naturally). I don’t think my mom was ever exposed to tacos and refried beans until we were at a Girl Scout jamboree camping trip circa 1988 so until then, we never ate them at home either. I couldn’t tell you if that was weird for the time but I CAN tell you tacos soon became a revolutionary meal in our house! In our house now, you’ll see tacos show up on our menu at least twice a month and while Kyle and I love to make them traditionally with my homemade taco seasoning, we’re not against trying other varieties either. These turkey tacos are a little different from the norm. There’s a little brown sugar and cider vinegar added, both of which add a tiny hint of sweetness to the turkey and boost the flavor of the tacos exponentially, especially with the contrast of a little heat from the chili powder. 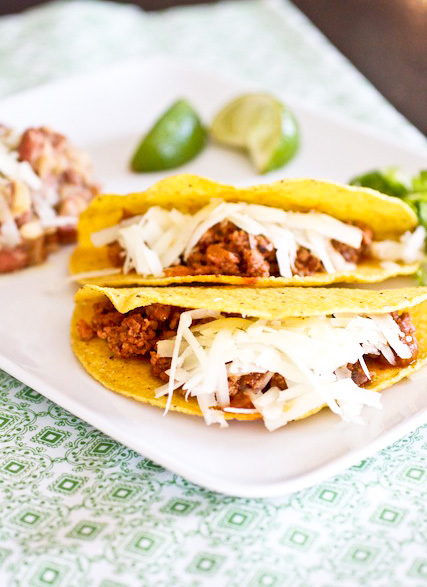 We freaking love these turkey tacos! I’ve been heating up the leftovers for lunches this week along with the leftover refried beans I made to go with the tacos and either for lunch or dinner, these tacos are already a mainstay on our menu! We’ve made them 3 times in the past 6 weeks! In a 12-inch skillet, heat oil over medium-high heat until shimmering. Add the onion and cook until softened, about 5 minutes. Add the chili powder, garlic, oregano, and tomato paste and stir for 30 to 60 seconds, until the tomato paste is evenly distributed. Add the turkey and cook for 3-5 minutes, breaking up the turkey with a wooden spoon into smaller pieces as it cooks; the turkey should be cooked through but still slightly pink. Stir in the tomato sauce, chicken broth, vinegar, and brown sugar and bring the mixture to a simmer; simmer until thickened, about 4 minutes. Season with salt and pepper before serving hot in taco shells. Stuff your tacos as desired. I love subbing turkey for beef. these look great, Tara! Totally love turkey for tacos! This recipe is more like a sloppy joe recipe I have except for the spices… i bet its as saucy as it is spicy, very tasty! Mmmm you are making me crave Mexican food. But then again, when am I NOT craving Mexican food? Great idea with the turkey. I will have to try it!! 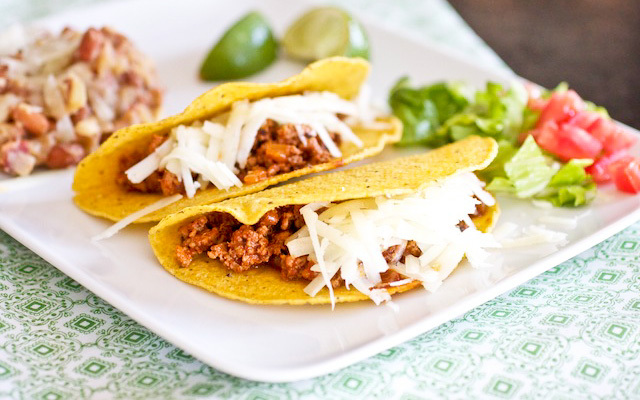 Love the healthy and the turkey in these tacos! I love using turkey instead of ground beef in things. It changes the classic up slightly and adds different flavours. I have been dying to make turkey tacos for ages, but I think you’ve just given me the inspiration to try it out this week! I’ve been making my chilli with ground turkey for ages now and like it even better than the original with ground beef. Made this and it was fantastic! Thanks!! how did you make the shells?